This walk: 2014-11-5. Leather Tor, Sharpitor, hut circles, Princetown, Hart Tor, Black Tor, Leeden Tor, Criptor, cist, Ingra Tor, quarry, crane bases, Ingra Tor Halt, Sweltor Quarry, King's Tor Quarry, Pew Tor, Routrundle. Previous walk in this area: 25th February 2009 & 15th September 2010. Most of the photographs were taken on a "recce" on 31st October. Clearly there had been wet weather which is why we considered cancelling the walk the night before it took place! Leather Tor, SX 563 700, elevation 380 metres (1246 feet). One of three hut circles, with the twp car parks showing. Bronze Age round house (hut circle) now occupied again! 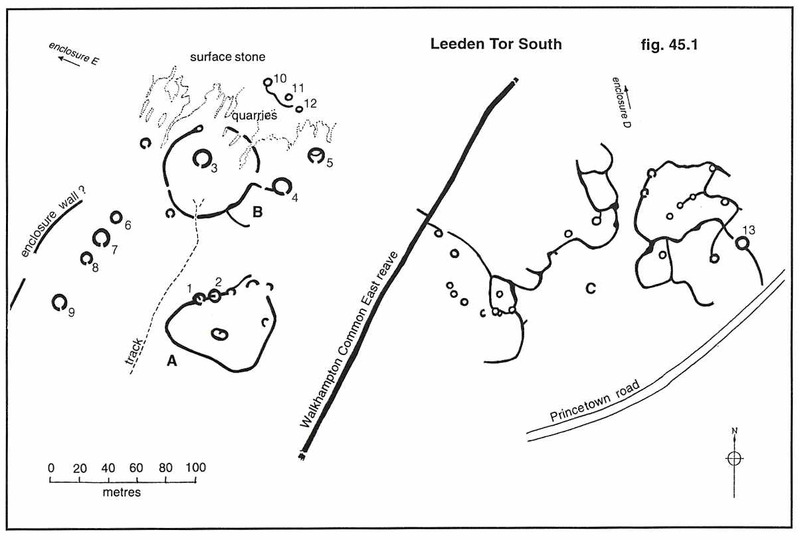 The settlement is described by Jeremy Butler, 1994, Dartmoor Atlas of Antiquities Vol. 3 - The South West, 45.1 Leeden Tor South (fig. 45.1), pages 36-37. North Hesaary Tor showing both the tor and the TV transmitter building. Closer view of the marks. That pile over there is the part marked as Leeden Tor on the 1:25k map! A fine example of horizontal "jointing" in weathered granite. Another version of lighting as the sun and cloud effects changed. Looking back at Leeden Tor. Looking across to Swelltor Quarry (Foggintor Quarry is behind this from here). Looking down on a bend in the old disused GWR track bed. Inside, this is quite a big cist as someone who got inside it once proved to us! 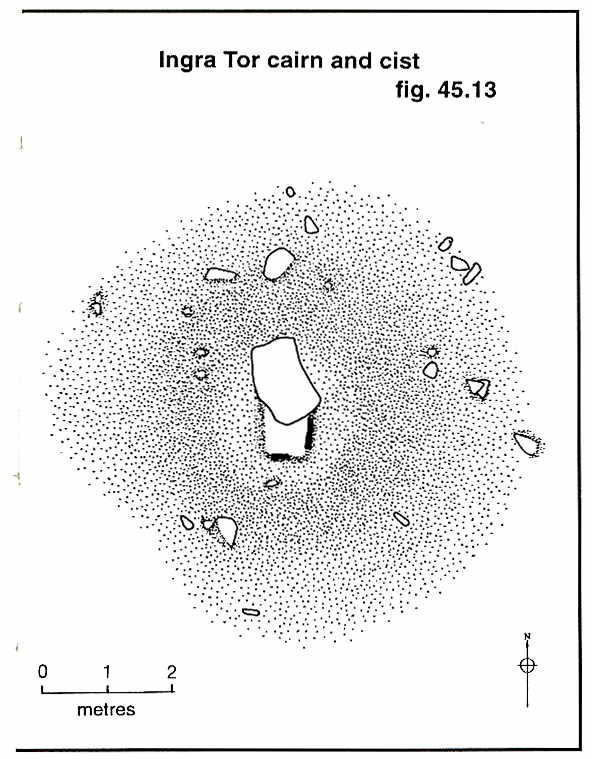 The cairn and cist are described by Jeremy Butler, 1994, Dartmoor Atlas of Antiquities Vol. 3 - The South West, 45.16 - RIngra Tor cairn and cist (fig. 45.13), page 51. Is it Middle Staple Tor? The concrete base of the halt building . A large pile of granite still waiting for a train to take it away? Zoomed view looking into King's Tor quarry. The point where the GWR and P&DR trackes diverged (or came together). The point where we left the railway track and cut down to the bridle path going to Routrundle. Ruins in a field beside the bridle path. A Google Earth image of the area - the enclosure in the previous photograph is the one towards the top of the image, with a round house inside it. They can see the cars - they're all smiling! The heifers in the car park were scratching themselves on the sharp headlight covers - I should have taken a movie! 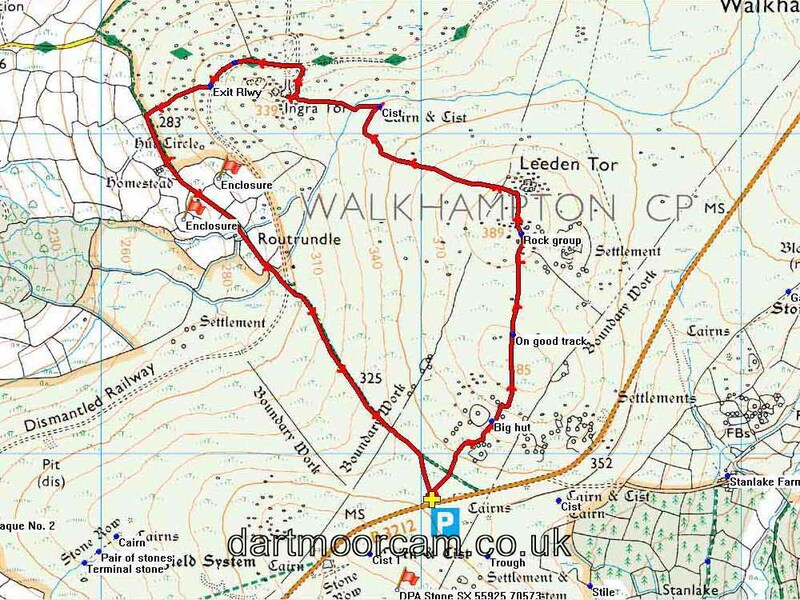 This walk was reached via the B3212 from Yelverton/Dousland towards Princetown, with parking at the P symbol on the map, actually on the north side of the road. Distance - 4.42 km / 2.75 miles.